Rojava is a de facto autonomous region originating in and consisting of three self-governing cantons in northern Syria, namely Afrin Canton, Jazira Canton and Kobani Canton, as well as adjacent areas of northern Syria like Shahba region. The region gained its de facto autonomy as part of the wider Syrian civil war, establishing and gradually expanding a secular polity based on the democratic confederalism principles of democratic socialism, gender equality, and sustainability. Also known as Syrian Kurdistan or Western Kurdistan (Kurdish: ‎Rojavayê Kurdistanê), Rojava is regarded by Kurdish nationalists as one of the four parts of Greater Kurdistan, which also includes parts of southeastern Turkey (Northern Kurdistan), northern Iraq (Southern Kurdistan), and northwestern Iran (Eastern Kurdistan). However, Rojava is polyethnic and home to sizable ethnic Kurdish, Arab, Assyrian, and Turkmen populations, with smaller communities of ethnic Armenians, Circassians, and Chechens. This diversity is mirrored in its constitution, society and politics. Since the constitutional update in December 2016, the official name of the polity governing throughout Rojava has been the Democratic Federation of Northern Syria. While entertaining some foreign relations, the cantons within Rojava are not officially recognized as autonomous by the government of Syria or any international state or organization. For their part, supporters of its constitution consider their system a model for a federalized Syria as a whole. Under Syrian rule, the polyethnic Rojava region suffered from persistent policies of Arab nationalism and attempts at forced Arabization, mostly directed against its ethnic Kurdish population, and the region received little investment or development from the central government. Laws discriminated against Kurds owning property, driving cars, and working in certain professions, and many were stripped of citizenship. As a consequence of a census in 1962, which was conducted for this purpose, 120,000 ethnic Kurdish citizens saw their citizenship arbitrarily taken away. This status was passed to the children of a “stateless” Kurdish father. In 2010, Human Rights Watch estimated the number of such “stateless” Kurdish people in Syria at 300,000. Kurds were not allowed to form their own political parties, and property was routinely confiscated by government loan sharks. Kurdish language education was forbidden, compromising Kurdish students’ education. Kurds weren’t allowed to open private schools for the education of their children, as other ethnic minorities in Syria like Armenians, Circassians, and Assyrians were. In addition, their hospitals lacked equipment for advanced treatment. In 1973, the Syrian authorities confiscated 290 square miles of fertile agricultural land in Al-Hasakah governorate, owned and cultivated by tens of thousands of Kurdish citizens, and gave it to Arab families brought in from other provinces. In 2007, also in Al-Hasakah governate, 230 square miles around Al-Malikiyah were similarly granted to Arab families, while tens of thousands of Kurdish inhabitants of the villages concerned were evicted. These and other expropriations of ethnic Kurdish citizens followed a deliberate plan, called the “Arab Belt initiative,” to depopulate the resource-rich Jazeera of its Kurdish inhabitants and settle Arabs there. In 2012, in the early stages of the Syrian civil war, Syrian government forces withdrew from three Kurdish enclaves, leaving control to local militias. Existing underground Kurdish political parties, namely the Democratic Union Party (PYD) and the Kurdish National Council (KNC), joined to form the Kurdish Supreme Committee (KSC) and established the People’s Protection Units (YPG) militia to defend Kurdish-inhabited areas in northern Syria. In July 2012, the YPG established control in the towns of Kobani, Amuda, and Afrin, and the Kurdish Supreme Committee established a joint leadership council to administer the towns. Soon the cities of Al-Malikiyah, Ras al-Ayn, al-Darbasiyah, and al-Muabbada also came under the control of the People’s Protection Units, as well as parts of Hasakah and Qamishli. The Kurdish Supreme Committee became obsolete in 2013, when the PYD abandoned the coalition with the KNC and adopted the aim of creating a polyethnic and progressive society and polity in a wider Rojava region of northern Syria. The PYD established the Movement for a Democratic Society (TEV-DEM) coalition based on an ideology of grassroots democracy rather than ethnicity. TEV-DEM then established popular assemblies according to the political philosophy of democratic confederalism. In January 2014, the cantons of Afrin, Jazira, and Kobani declared their autonomy and the Constitution of Rojava was approved. From September 2014 to spring 2015, YPG forces in Kobani, supported by some secular Free Syrian Army militias and leftist international and PKK volunteers, fought and finally repelled an assault and siege by ISIS. After a YPG offensive during the summer of 2015, Jazira Canton and Kobani Canton were connected. In December 2015, the Syrian Democratic Council was created. In January/February 2016, the autonomous Shahba region was founded and established as a fourth canton. On March 17, 2016, at a TEV-DEM-organized conference in Rmelan, Syrian Turkmen, Arab, Christian, and Kurdish officials declared the establishment the Democratic Federation of Rojava/Northern Syria in the areas they controlled. The declaration was quickly denounced by both the Syrian government and the National Coalition for Syrian Revolutionary and Opposition Forces. In March 2016, Hediya Yousef and Mansur Selum were elected co-chairpersons for the executive committee to organize a constitution for the region, to replace the 2014 constitution. Yousef said the decision to set up a federal government was in large part driven by the expansion of territories captured from Islamic State. In July 2016, a draft for the new constitution was presented, taking up the general progressive and democratic confederalist principles of the 2014 constitution, mentioning all ethnic groups living in Rojava, and addressing their cultural, political and linguistic rights. The only political camp within Rojava opposed to this were Kurdish nationalists, in particular the KNC, which wants to pursue a path toward a nation-state of Kurdistan rather than establishing a polyethnic federation as part of Syria. 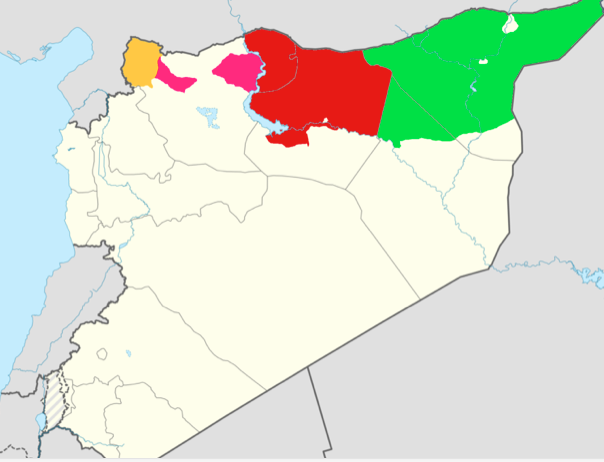 On December 28, 2016, after a meeting of the 151-member Syrian Democratic Council in Rmelan, the new constitution was accepted over the objections of 12 Kurdish parties, the name “Rojava” was officially removed from the full name of the federal region ,and the region was renamed the Democratic Federation of Northern Syria. The constitution, ratified on January 9, 2014, provides that all Rojava residents shall enjoy a fundamental right of gender equality and freedom of religion. It also provides for property rights. Abdullah Öcalan, a Kurdistan Workers’ Party (PKK) leader imprisoned in İmralı, Turkey, is an iconic and popular figure in Rojava whose ideas shaped the region’s society and politics. In prison, Öcalan corresponded with (and was influenced by the ideas of) Murray Bookchin, who favored social ecology, direct democracy, and libertarian municipalism (i.e., a confederation of local citizens’ assemblies). In March 2005, Öcalan issued his Declaration of Democratic Confederalism in Kurdistan based on Bookchin’s ideas, calling upon citizens “to stop attacking the government and instead create municipal assemblies, which he called ‘democracy without the state. '” Öcalan envisioned these assemblies as forming a pan-Kurdistan confederation, united for purposes of self-defense and with shared values of environmentalism, gender equality, and ethnic, cultural, and religious pluralism. The ideas of Bookchin and Öcalan became established in Rojava, where hundreds of neighborhood-based communes have been established across the three Rojava cantons. The governance model of Rojava emphasizes local management, with democratically elected committees making decisions. The polyethnic Movement for a Democratic Society (TEV-DEM), led by the Democratic Union Party (PYD), is the political coalition governing Rojava, succeeding a brief intermediate period from 2012-2013, when a Kurdish Supreme Committee was established by the PYD and the Kurdish National Council (KNC), a coalition of Kurdish nationalist parties, as the governing body. Local elections were held in March 2015. The Rojava system of community government is based on direct, Athenian-style democracy. In this model, states become less relevant and people govern through councils as well as through a variety of groups, committees and communes meeting weekly to talk about the problems people face where they live. The representatives of the different community groups meet in the main group in the villages or towns called the House of the People. As a September 2015 report in the New York Times observed: “As a former diplomat, I found it confusing: I kept looking for a hierarchy, a leader, or signs of a government line, when, in fact, there was none; there were just groups. There was none of that stifling obedience to the party, or the obsequious deference to the ‘big man,’ a form of government all too evident just across the borders, in Turkey to the north, and the Kurdish regional government of Iraq to the south. The confident assertiveness of young people was striking.” A 2016 paper from Chatham House, on the other hand, stated that power is heavily centralized in the hands of the PYD. In December 2015, during a meeting of representatives of North Syria in Al-Malikiyah, the participants decided to establish a Federal Assembly, the Syrian Democratic Assembly to serve as the political representative of the Syrian Democratic Forces. The co-leaders selected to lead the Assembly at its founding were prominent human rights activist Haytham Manna and TEV-DEM Executive Board member Îlham Ehmed. On the level of the Rojava federation, Federal Council ministries deal with the economy, agriculture, natural resources, and foreign affairs. The ministers are appointed by TEV-DEM; general elections were planned to be held before the end of 2014, but this was postponed due to fighting. Among other stipulations outlined is a quota of 40% for women’s participation in government, as well as another quota for youth. In connection with a decision to introduce affirmative action for ethnic minorities, all governmental organizations and offices are based on a co-presidential system. In 2015, the Rojava administration introduced primary education in the native language (either Kurdish or Arabic) and mandatory bilingual education (Kurdish and Arabic) for public schools, with English as a mandatory third language. In August 2016, the Ourhi Centre was founded by the Assyrian community in the city of Qamishli to educate teachers in order to make Syriac-Aramaic an additional language in public schools in Jazira Canton, starting in the 2016/17 academic year. According to the Rojava Education Committee, in 2016/2017 “three curriculums have replaced the old one, to include teaching in three languages: Kurdish, Arabic and Assyrian.” While there was no institution of tertiary education on the territory of Rojava at the onset of the Syrian civil war, an increasing number of such institutions have been established by the cantonal administrations in Rojava since. In September 2014, the Mesopotamian Social Sciences Academy in Qamishli started classes. More such academies designed under a libertarian socialist academic philosophy are in the process of founding or planning. In August 2015, the traditionally-designed University of Afrin in Afrin opened with initial programs in literature, engineering, and economics, and institutes for medicine, topographic engineering, music, theater, business administration, and the Kurdish language. In July 2016, the Jazira Canton Board of Education opened the University of Rojava in Qamishli, with faculties for medicine, engineering, sciences, and arts and humanities. Programs taught include health, oil, computer and agricultural engineering; physics, chemistry, history, psychology, geography, mathematics, primary school teaching, and Kurdish literature. Its language of instruction is Kurdish, and with an agreement with Paris 8 University in France for cooperation, the university opened registration for students in the academic year 2016-2017. Incorporating the Universal Declaration of Human Rights, the International Covenant on Civil and Political Rights, the International Covenant on Economic, Social and Cultural Rights, as well as other internationally recognized human rights conventions, the 2014 Constitution of Rojava guarantees freedom of speech and freedom of the press. As a result, a diverse media landscape has developed in Rojava, in the Kurdish, Arabic, Syriac-Aramaic and Turkish languages, as well as in English. Media outlets frequently use more than one language. Among the most prominent media in Rojava are the Hawar News Agency and ARA News news agencies and websites as well as Rojava Kurdistan TV, Ronahi TV, and the bimonthly magazine Nudem. A landscape of local newspapers and radio stations has also developed. In May 2016, Ahmed Yousef, head of the Economic Body and chairman of Afrin University, estimated that the Rojava region’s economic output, including agriculture, industry, and oil, accounted for about 55% of Syria’s gross domestic product. Diverse agricultural production is the economic backbone of all Rojava cantons. Afrin Canton has a traditional specialization in olive oil, including Aleppo soap made from it, and has drawn much industrial production from the nearby city of Aleppo due to longstanding civil war fighting in that city. Jazira Canton is a major wheat and cotton producer and has a considerable oil industry. Kobani Canton, which has suffered the most destruction of the three cantons, has huge challenges in reconstruction, but has recently seen greenhouse agriculture spreading. Price controls are managed by democratic committees per canton, which can set the price of basic goods such as for food and medical goods. Oil and food production exceeds demand, so the most important exports are oil and agricultural products such as sheep, grain, and cotton. The most important imports are consumer goods and auto parts. The border crossing with Iraqi Kurdistan, intermittently closed by the Kurdistan Regional Government (KRG) on the Iraqi side, has been open since June 2016, with the resulting trade contributing to economic dynamism in Rojava. Turkey doesn’t yet allow businesspeople or goods to cross its border. Since the permanent opening of the border crossing with Iraqi Kurdistan in June 2016 and the establishment of a corridor between Syrian government controlled territory and Jazira Canton and Kobani Canton in April 2017, economic exchange flows have normalized and contribute momentum to economic activity. In May 2017 in northern Iraq, the Popular Mobilization Forces fighting ISIS there also conquered a corridor connecting Rojava and Iraqi government controlled territory. The civil laws of Syria are valid in Rojava, as long as they don’t conflict with its constitution. One notable example for amendment is personal status law, which in Syria is still based on sharia and applied by sharia courts, while secular Rojava proclaims absolute equality of women under the law and a ban on forced or underage marriage and polygamy. For the first time in Syrian history, civil marriage is being allowed and promoted, a significant move towards a secular open society and intermarriage between people of different religious backgrounds. A new criminal justice approach has also been implemented that emphasizes restoration over retribution, with the death penalty abolished. Prisons house mostly those charged with terrorist activity related to ISIS and other extremist groups. A September 2015 Amnesty International report noted that 400 people were incarcerated, which based on a population of 4.6 million makes an imprisonment rate of 8.7 people per 100,000, compared to 60.0 people per 100,000 in Syria as a whole. It’s the second lowest rate in the world after San Marino. The report noted some deficiencies in due process, however. The new justice systems in Rojava reflect the revolutionary concept of democratic confederalism. At the local level, citizens create Peace and Consensus Committees, which make group decisions on minor criminal cases and disputes while separate committees resolve issues of specific concern to women’s rights like domestic violence and marriage. At the regional level, citizens are elected by the regional People’s Councils to serve on seven-member People’s Courts. At the next level are four Appeals Courts, composed of trained jurists. The court of last resort is the Regional Court, which serves Rojava as a whole. Distinct and separate from this system, the Constitutional Court renders decisions on compatibility of acts of government and legal proceedings with the Constitution of Rojava. The police function in Rojava cantons is performed by the Asayish armed formation. Asayish was established on July 25, 2013 in order to fill the gap of security when the Syrian security forces withdrew and the Rojava revolution began. Under the Constitution of Rojava, policing is a competence of the cantons. Overall, the Asayish forces of the cantons are composed of 26 official bureaus that aim to provide security and solutions to social problems. The six main units of Rojava Asayish are Checkpoints Administration, Anti-Terror Forces Command (HAT), the Intelligence Directorate, the Organized Crime Directorate, the Traffic Directorate, and the Treasury Directorate. 218 Asayish centers were established and 385 checkpoints with 10 Asayish members in each checkpoint. 105 Asayish offices provide security against ISIS on the frontlines across Rojava. Larger cities have general directorates responsible for all aspects of security including road controls. Each Rojava canton has a HAT command and each Asayish center organizes itself autonomously. Throughout Rojava, the municipal Civilian Defense Forces (HPC) and the cantonal Self-Defense Forces (HXP) also provide local-level security. Police are trained in non-violent conflict resolution and feminist theory before being allowed access to a weapon. Directors of the Asayish police academy have said that the long-term goal is to give all citizens six weeks of police training before ultimately eliminating the police. Rojava’s most important defense militia is the People’s Protection Units (Yekîneyên Parastina Gel, YPG). The YPG was founded by the PYD party after the 2004 Qamishli clashes, but it wasn’t active until the Syrian civil war. It’s under the control of the Movement for a Democratic Society (TEV-DEM). Another militia closely related to Rojava is the Syriac Military Council (MFS), an Assyrian militia associated with the Syriac Union Party. The YPG, the MFS, and other militias in Rojava, like the Army of Revolutionaries or the Al-Sanadid Forces, are under the umbrella of the Syrian Democratic Forces (SDF). The same is true for the municipal military councils established in Shahba region, like the Manbij Military Council, the Al-Bab Military Council, and the Jarablus Military Council. The Self-Defense Forces (HXP) is a multi-ethnic territorial defense militia and the only conscript armed force in Rojava. HXP is locally recruited to garrison their municipal area and is under the responsibility and command of the respective cantons of Rojava. Occasionally HXP units have supported the YPG and SDF during combat operations against ISIS outside their own municipality and canton. Most ethnic Kurdish and Arab people in Rojava adhere to Sunni Islam, while ethnic Assyrian people generally are Syriac Orthodox, Chaldean Catholic, or Syriac Catholic Christians. There are also adherents of other faiths, such as Zoroastrianism and Yazidism. Many people in Rojava support secularism and laicism. The dominant PYD party and the political administration in Rojava are decidedly secular and laicist and contrary to most of the Middle East, religion is not a marker of socio-political identity. Combat between the Rojava People’s Protection Units (YPG) and Syrian government forces has been rare – in the most notable instances some of the territory still controlled by the Syrian government in Qamishli and al-Hasakah has been lost to the YPG. In some military campaigns, in particular in northern Aleppo governate and in al-Hasakah, there has been a tacit cooperation between the YPG and Syrian government forces against Islamist forces, ISIS, and others. In March 2015, the Syrian information minister announced that his government was considering recognizing Kurdish autonomy “within the law and constitution.” While the Rojava administration is not invited to the Geneva III peace talks on Syria, Russia, which calls for their inclusion, does to some degree carry their positions into the talks, as documented in Russia’s May 2016 draft for a new constitution for Syria. In October 2016, a Russian initiative for federalization with a focus on northern Syria was reported, which at its core called to turn the existing institutions of the Democratic Federation of Rojava/Northern Syria into legitimate institutions of Syria; also reported was its rejection for the time being by the Syrian government. Rojava’s dominant political party, the Democratic Union Party (PYD), is a member organization of the Kurdistan Communities Union (KCK) organization. As KCK member organizations in neighboring states with autochthonous Kurdish minorities are either outlawed (Turkey, Iran) or politically marginal with respect to other Kurdish parties (Iraq), PYD-governed Rojava has acquired the role of a model for the KCK political agenda and blueprint in general. There is much sympathy for Rojava among Kurds in Turkey, and during the siege of Kobani, a large number of ethnic Kurdish Turkish citizens crossed the border and volunteered in the defense of the town. Some of these upon their return to Turkey took up arms in the Kurdish-Turkish conflict. The relationship of Rojava with the Kurdistan Regional Government in Iraq is complicated. The governing party there, the Kurdistan Democratic Party (KDP), views itself and its affiliated Kurdish parties in other countries as a conservative and nationalist alternative and competitor with the KCK political agenda. Like the KCK umbrella in general, the PYD attempts to denounce the ideology of nationalism, including Kurdish nationalism. This stands in stark contrast to the Kurdish nationalist visions of the Iraqi Kurdish KDP-sponsored Kurdish National Council in Syria. Rojava’s most notable role in the international arena is the comprehensive military cooperation of its militias under the Syrian Democratic Forces (SDF) umbrella with the United States and the international (US-led) coalition against ISIS. In a public statement in March 2016, the day after the declaration of the Democratic Federation of Rojava/Northern Syria, U.S. Defense Secretary Ashton Carter praised the Rojava People’s Protection Units (YPG) militia as having “proven to be excellent partners of ours on the ground in fighting ISIS. We’re grateful for that, and we intend to continue with it, recognizing the complexities of their regional role.” In late October 2016, U.S. Army Lt. Gen. Stephen Townsend, the commander of the international Anti-ISIS-coalition, said that the SDF would lead the impending assault on Raqqa, ISIS’s stronghold and capital, and that SDF commanders would plan the operation with advice from American and coalition troops. At various points in time the U.S. has embedded U.S. troops with the SDF along the border between Rojava and Turkey, in order to deter Turkish aggressions against the SDF. In the diplomatic field, Rojava lacks any formal recognition, and only Russia has on occasion supported Rojava’s political ambition of the federalization of Syria in the international arena (the U.S. does not). After peace talks between Syrian civil war parties in Astana in January 2017, Russia offered a draft for a future constitution of Syria, which would turn the “Syrian Arab Republic” into the “Republic of Syria,” introduce decentralized authorities and elements of federalism, strengthen the parliament at the expense of the presidency, and realize secularism by abolishing Islamic jurisprudence as a source of legislation. During 2016 the Democratic Federation of Northern Syria opened official representation offices in Moscow, Stockholm, Berlin, Paris, and The Hague. A broad range of public voices in the U.S. and Europe has called for more formal recognition of Rojava. Neighboring Turkey is persistently hostile, because it feels threatened by Rojava’s encouraging activism for autonomy among Kurds in Turkey. Its policy towards Rojava is based on an economic blockade, persistent attempts at international isolation, opposition to the cooperation between the American-led anti-ISIS coalition and the Syrian Democratic Forces, and support of Islamist opposition fighters hostile toward Rojava, including ISIS. Turkey has on several occasions attacked Rojava territory and defense forces militarily.